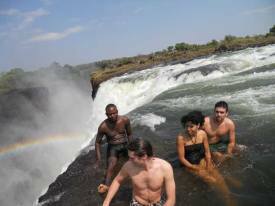 The Devils Swimming Pool and Livingstone Island Tour is an Exhilarating and Memorable Experience. 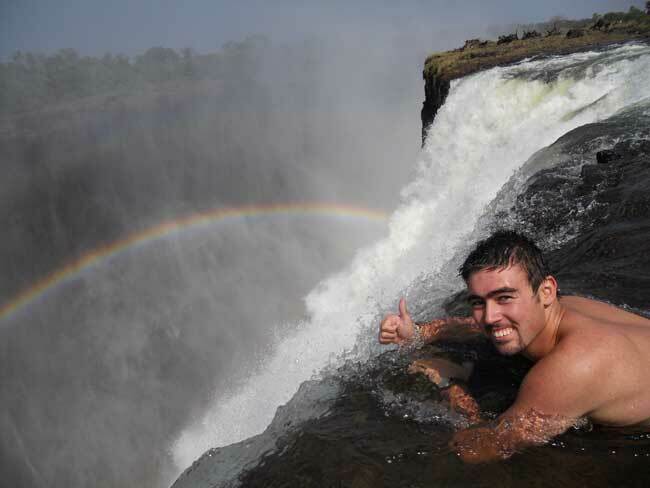 This activity is only available from the Zambian side of Victoria Falls. Livingstone Island was opened in 1992 to provide exclusive and unique picnics on the edge of the Victoria Falls. It is a protected area, that is only allowed a maximum of 24 people on at any one time. The utmost care is taken to protect and preserve the natural habitat of the area. There is only one company that has been issued with an exclusive operators licence to conduct the Livingstone Island and Devils swimming pool tours. Please note that there are several off-the-street guides who offer tourists the opportunity to do this activity, but these guides are not licensed and we would strongly advise against going with one of them. Accidents have occurred with these guys which have led to bad publicity. Single Click to enlarge images of Devils Pool. At one stage we were very reluctant to recommend the Devils Swim as we felt is was quite dangerous, but having done the Livingstone Island Tour and the devils swim on numerous occasions now, we have had a change of heart. It is an awesome once in a lifetime experience and the operation is extremely well managed and run, with safety being a high priority. When the water level of the Zambezi is too high, the island is completely closed, so neither the "Island Tour" or the "Devils Swim" are open (see below). As the water level drops, the "Island Tour" opens but the water is still too high to swim in the Pools. As the water level drops even further, first the "Angel Pool" then the "Devil Pool" opens allowing both the "Island tour" and the "Devils Swim" to be done. This happens in reverse when the river is rising. The activities remain the same price regardless of whether both activities are done or not. You can do the Island Tour and it is not compulsory to Swim in the Devils Pool, it is a personal choice. 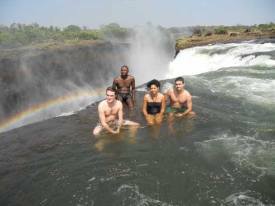 The Livingstone Island tour is seasonal and can only be done when the water level of the Zambezi River is low enough to allow safe access to Livingstone Island. This is from approximately late June to early March. Approximately mid July to late August and early January through till mid February. The Devils swimming Pool is available for an even shorter period as the water level has to be really low to allow for safe swimming. Although variable every year this is normally from late August to early January. 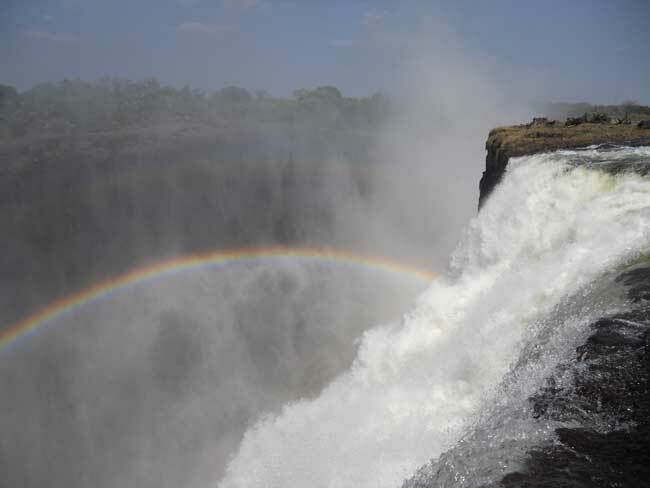 As the name suggests this is the island from which David Livingstone first witnessed the Falls in November 1855. 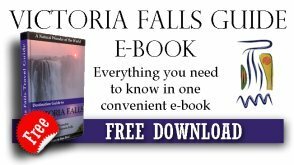 From here he lowered a length of calico with a bullet attached as a weight to measure the depth of the Falls. Five trips are offered throughout the day (details below) each trip lasting about 1.5 to 2 hrs. The departure or meeting place is by the deck at the Royal Livingstone Hotel where you will meet your guides and be given an introduction of what to expect, as well as a safety talk. 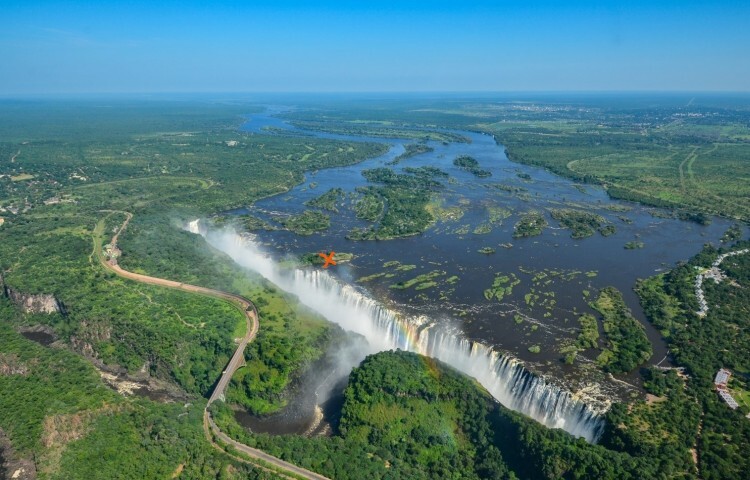 From there a five minute boat ride speeds you through the current of the Zambezi River, twisting and turning as the captain navigates his way through the rocky channels, this in itself is an exhilarating experience as you head towards the rising column of spray from the Victoria Falls. Once on the sandy and rocky island, you are greeted by the island staff with a traditional Maheu energy drink made from maize meal and are then led to the very edge of the Falls on the east of the island overlooking Horseshoe and Rainbow Falls. In 2005 a commemorative plaque was erected here to commemorate 150 years since Livingstone's first arrival. The guides then lead you to the west of the island overlooking Main Falls. Wow... what a magnificent view, as the main torrent of water gushes over the basalt precipice. It's like no other view of the Falls and gives a completely different perspective to the views one gets from the path through the Rainforest on the other side of the canyon. During the morning trips, if it's sunny day, the rainbows are just incredible. It's truly jaw dropping and honestly I can't recommend it highly enough. Now is your chance to jump into the Devils Pool if you wish, this is not compulsory and is only if you feel comfortable. Stripping down to your swimming costume (they have spares just in case you thought you weren't brave enough, but have now suddenly worked up the courage) your guide leads you and explains your route. You swim slightly upstream in a very slow current, being a strong swimmer is not a prerequisite. A safety rope is also in place as an added precaution. 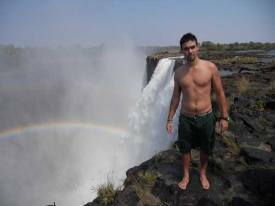 You then climb out on another rocky outcrop close to the edge of the Falls and the Devils Pool. The Devils Pool itself is a deep natural pool that has been created by thousands of years of erosion, but what is unique about it is that there is a rock ledge on the lip of the Falls, where the water is only a few centimetres deep. This natural barrier is what allows you to jump into the deep pool but not get swept over the edge. You can now lie on this rock lip at the edge of the Devils Pool and look right into the 103m chasm of the Falls, with huge torrents of water flowing just meters away. The guides will take photos and video of you with your camera if you have one. 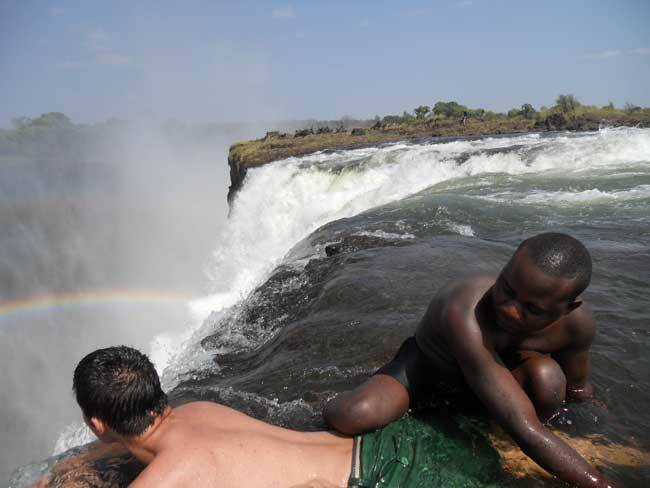 The Devils Pool has a real adrenaline high and people who have experienced it Love it!. Once back on Livingstone Island you will be treated to either breakfast, lunch or snacks depending the the time of day you have gone. Your boat then whisks you back to the mainland at Royal Livingstone Hotel (RLH). A Magical experience! • If you have any specific dietary requirements, please advise at the time of your booking. 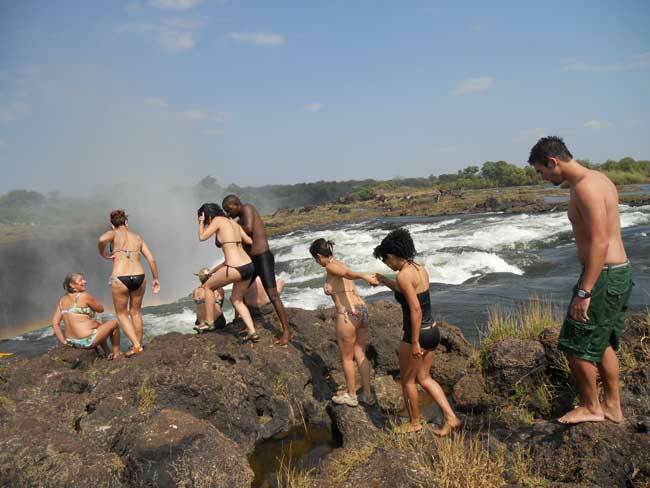 • Children 12 and under are not permitted on any Livingstone Island and Devil's Pool trip. It's easy just type in your story below then click the "Share your Adventure" button. Thanks from all our readers we really appreciate your effort!!! Here's where you read the Tales of other Travellers !! I realisze my dream! It´s wonderful! It was a senstional trip and I discovered a beautiful and very clean town.